Thank you for registering for The 17th Annual New Jersey Marathon Weekend! In an effort to make your participation more enjoyable, I will send all registered participants a series of brief weekly updates via email. Copies of these updates are also available on: our Website, Facebook, Twitter and Blog. Registration for each of our races continues to grow! We are currently 10% ahead of last year’s record numbers. We expect registrations of about 3,700 for the Full Marathon and about 8,700 for the Half Marathon & Relay. We anticipate that we’ll need to close registration by mid-April. Please pass the word along to your running friends that people waiting until the last minute to register, MAY be closed out in 2013! Please note: on-line Registration will remain open until either we sell out, or until 04/28/2013. If we don’t sell out, we will be accepting last-minute applications for the full and half marathons at the expo (no new relay teams can be created after registration closes on 04/28/2013). Location: Our Health & Fitness Expo and Packet Pick-up Service is being held at Monmouth Park Racetrack (175 Oceanport Ave, Oceanport, NJ 07757) again this year. Free activities at the expo include: speakers to help you to be a healthy, efficient athlete; exercise, yoga and stretching classes, fun kids’ activities, and live music. So come with your workout clothes and spend some time enjoying all we have to offer! There are also several places for lunch and refreshments in the Clubhouse area. The activities at the expo and the parking are free! Saturday, May 4th is Kentucky Derby Day at Monmouth Park. Mint juleps and fancy hats are the order of the day in the Clubhouse area. After visiting the Expo, why not head over to have lunch, place your bet and watch the simulcast races. A free Race Packet Pick-Up Service (bib #/timing chip/event t-shirt/race day gear bag) is available during the Expo hours listed above. The race does not mail out race packets. Please note: you may have a friend or relative (your Proxy) pick up your race packet for you during the Expo hours – if you are unable to do so yourself. You will be receiving, via email, a “Registration & Waiver Confirmation Form” which lists your: name, bib #, corral assignment, t-shirt size, race entered, etc. This form will be sent out at two different times, once in April and another mailing in early May, which will be based on when you register. This form must be printed out, signed, and the original – brought to Race Packet Pick-up at the Health & Fitness Expo, along with a government issued photo ID. At the expo a volunteer will collect this form, check your ID and verify the information with you before providing your race bib/timing chip, etc. The race does not provide a free Packet Pick-up Service on race day, however you may choose to hire a proxy to pick it up for you during the Expo hours and hand it to you on race day starting at 5 am. You may choose to sign up for this Optional Packet Pick-up Service by clicking on this link: Register for Optional Packet Pick-up Service. Our soon to be USAT&F-certified Full Marathon course will be visiting 8 Jersey Shore communities again this year. A special “Thank You” to Oceanport, Monmouth Beach, Long Branch, Deal, Allenhurst, Loch Arbour, Asbury Park and Ocean Grove for allowing us onto their streets and boardwalks, and working so closely with our Staff to make this happen! Our soon to be USAT&F-certified Half Marathon course will again be visiting 3 Jersey Shore communities. A special “Thank You” to Oceanport, Monmouth Beach and Long Branch for welcoming our athletes in such a warm way each year! The businesses and residents of these communities have made this race a very special event over the years! In spite of the October Super storm, each of these 8 Shore communities has offered up major roadways so that our events can take place again this year! Please note: 1) Some rerouting of our courses may be required this year. We expect to have updated course maps available as soon as the preliminary certification process has been completed (in March). 2) Many residents along our course routes are unable to leave their homes for hours on race day to help ensure that you have safe streets to race on. Please remember to thank them wherever you have the opportunity. The Long Branch Half Marathon & Half Marathon Relay will start at 6:45 am, beginning with the wheelchair athletes. They will be followed in waves by the various corrals, in 60-second intervals. The New Jersey Marathon will start at 8:00 am, beginning with the wheelchair athletes. They will be followed in waves by the various corrals, in 60 second intervals. The start order, and start times, listed above are required for two main reasons: 1) to eliminate interference along the last 1.35 miles of the race courses, as the fastest full marathoners have experienced significant delays due to congestion, as they arrived at the same time as the bulk of the half marathoners, and 2) all athletes must be across the train tracks in Oceanport within the available “clear-track interval set by NJ Transit (all trains will be held up to ensure safe passage). All Half Marathon & Relay athletes who will be at the mile 5 marker between 8:12 am (15 min/mi) and 8:20 am (16 min/mi) will be asked to move to the sidewalks and obey all traffic signs for the remainder of their race. All Half Marathon & Relay athletes who will not be at the mile 5 marker by 8:20 am will be asked to leave the course and will be offered transportation to either the transition area (relay) or to the finish area. Expo and Race Packet Pick-up: parking info, event schedules, packet pick-up requirements, etc. Race day arrival scheduling, traffic control and parking plans. 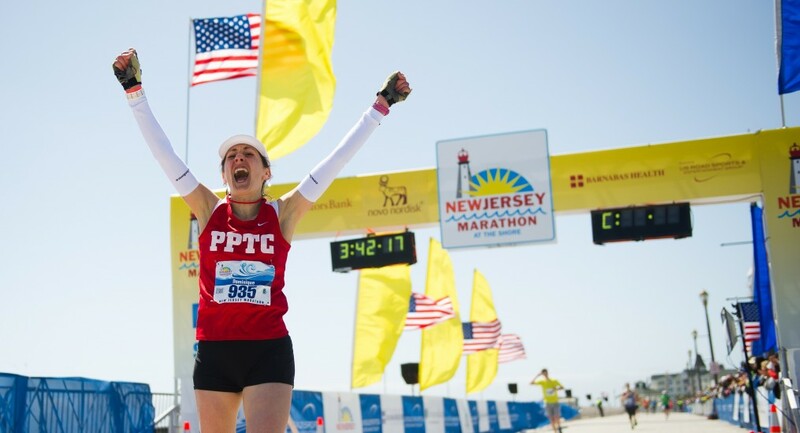 Shuttle Transportation schedules and departure points, including the Special New Jersey Marathon Train. The Half Marathon Relay transition information and shuttle times and pick-up locations. Entertainment/Exercise/Speaker schedules for – the expo, race day, and post-race celebrations. Special Events: food drive, used athletic shoe drive, pasta dinner, Last Long Training Run, etc. Start Area – Corrals and loading times, pacing team locations, bathroom locations, gear check locations. spectator, & athlete food and hydration options, etc. Finish Area – Massage, medical, reunion area, Charity Village, post-race food, and entertainment, etc. Post race – The route to Long Branch Station for the NJ Transit train and the Monmouth Park shuttle bus location. Spectator vantage points and suggestions for moving around the courses on race day. I hope that you will find these weekly updates helpful in planning your time with us! Please note: much of the information above can be found on our website. This entry was posted in Race Info and tagged New Jersey Marathon Race Director Update. Bookmark the permalink. ← So….How is your training going? I love these race director updates. The interaction between the race director and runner is great, and one of the things that makes this marathon amazing!